An exhibition has been organised to mark the 75th anniversary of "floating" tanks sinking during D-Day training. It is believed seven Valentine tanks sank in Studland Bay off the Dorset coast during Exercise Smash in April 1944, killing six men. 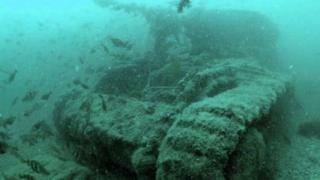 Isle of Purbeck Sub-Aqua Club's (IPSAC) Valentine 75 project has been mapping and recording the history of the tanks. The exhibition put on by the club and Bournemouth University aims to tell the story of the tragedy. The last remaining floating tank has also been spotted on Studland beach as part of the commemorations, and posters of the tanks have been placed around the area. 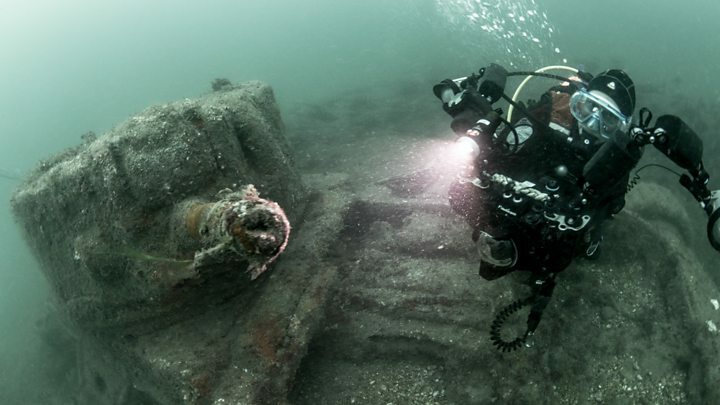 The project began in 2017, with divers surveying the condition of the tanks. The exhibition includes photographs and video of their findings. Six weeks before D-Day, troops gathered in Studland to rehearse the Normandy landings operation of World War Two - including the testing of the amphibious Valentine tanks. Although it is thought seven tanks lie in Studland Bay, only six are mentioned in a diary that documented the exercise. Charles Robert Gould, Victor Hartley, Albert Victor Kirby, Arthur Jackson Park, Earnest Granville Petty and Victor Noel Townson, of the 4th/7th Royal Dragoon Guards, lost their lives. The Studland Submerged exhibition at the Discovery Centre continues until Friday.